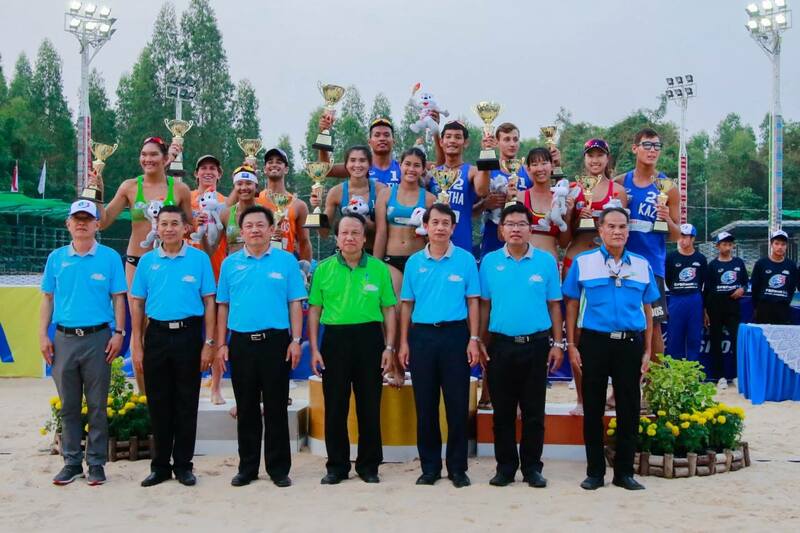 Roi Et, Thailand, March 18, 2019 – Thailand underlined their complete dominance at the SMM Asian U21 Beach Volleyball Championships at Ban Nong Ya Ma Community School Courts on Monday when their spikers captured both titles on offer in the four-day, double-gender competition which served as the qualification tournament for the FIVB Beach Volleyball U21 World Championships to be held later this year in Udon Thani, Thailand. In the men’s event, Thailand1’s formidable Phanupong Thanan/Phichakon Narathon, who stormed past Kazakhs Aldash/Mokhammad 21-8, 21-14 in the morning semi-final match, remained invincible in their final showdown against Landers/Brownhill to beat the Australian duo in comfortable straight sets 21-15, 21-15 in 33 minutes. Landers and Brownhill pulled off a hard-fought three-set 23-21 15-21 15-11 win over Nicolaidis/Nix in the all-Australians semi-final clash earlier. 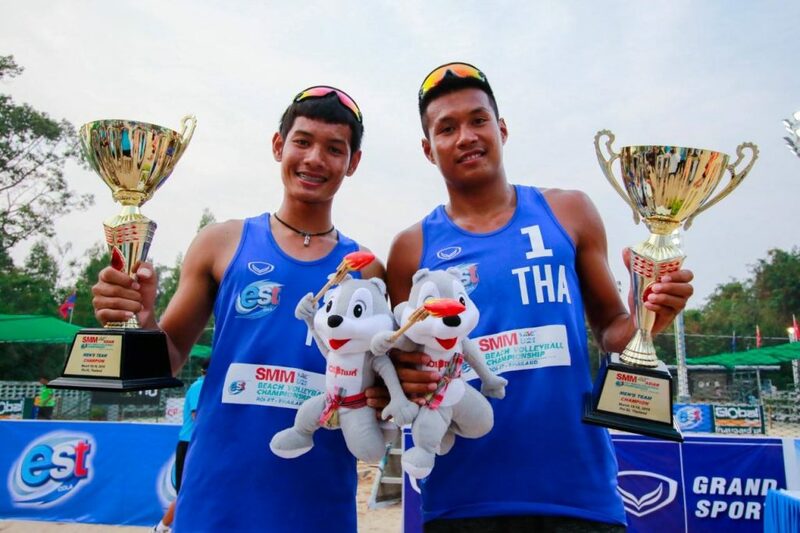 Without any doubt, history was made on Monday as top seeds Phanupong and Phichakon combined in perfection to hand Thailand the first ever men’s gold medal in the Asian U21 Beach Volleyball Championships. 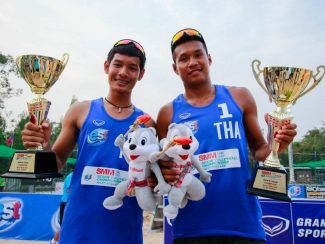 The Thai duo failed to make their mark at the previous edition two years ago here to finish a disappointing ninth place. “We felt really under pressure and excited before the match as we have never played them before. In some tournaments, we also did not go this far, so we had no chance to play each other. I think today we played well according to the coach’s strategy and our game plan. 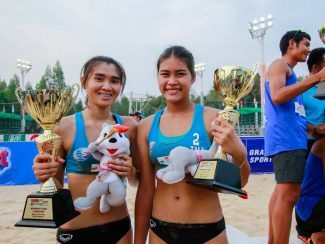 It is such a pleasure to play in the final and I am very happy to win this tournament,” said Phanupong, who partnered Phichakorn to finish runners-up at the last year’s Asian U19 Beach Volleyball Championships in Nakhon Phatom,Thailand. “With the win here, we are assured of winning a berth to compete in the World Championships. We will try to prepare ourselves as best as possible. We set our own target to finish among the last eight teams there. We will do our best,” he added. In the third-place play off earlier, Aldash/Mokhammad of Kazakhstan smashed Australia’s dreams of winning a medal here as they comfortably defeated Nicolaidis/Nix 21-16 21-19 in 32 minutes to be content with bronze medal. 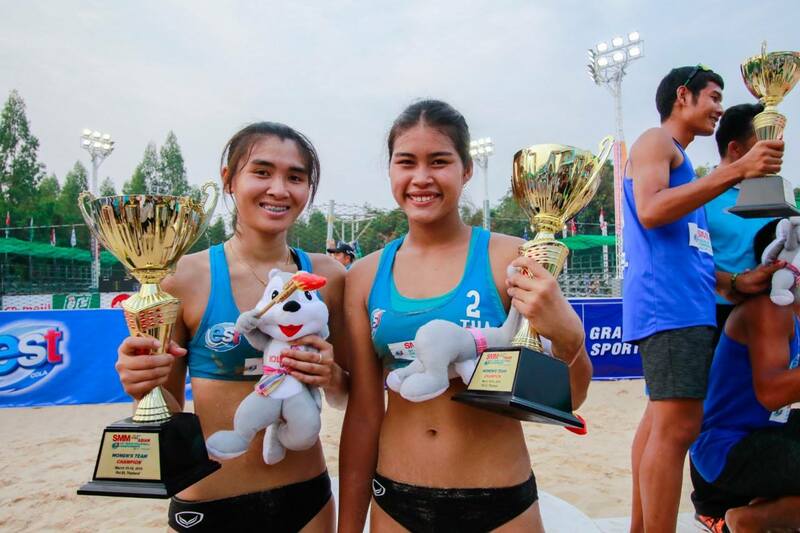 In the women’s competition,Thatsarida Singchuea /Pawarun Chanthawichai of Thailand 2 successfully captured a back-to-back title as they recorded a hard-earned 2-1 (22-20, 13-21, 25-23) win over Chanthira/Yodsaphat in the all-Thais final showdown. The significant success has given Thatsarida/Pawarun a promising future. 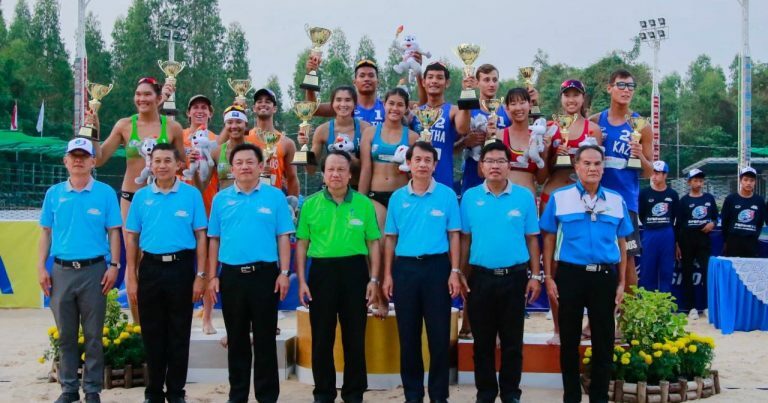 With another gold accomplished here in Roi Et, the superb duo have already claimed four titles overall consisting of two at the Asian U21 Championships (2017 and 2019) and one each at the Asian U17 Championships and the Asian U19 Championships in 2016 and 2018 respectively. Cheered on lustily by a large number of home spectators at the packed competition venue, Thatsarida/Pawarun started well in their final showdown against compatriots Chanthira/Yodsaphat to clinch the hard-fought first set 22-20. However, Chanthira/Yodsaphat clawed their way back to seal the second set 21-13. The decider turned out to be an action-paced battle, with both teams giving their best to entertain the cheering crowds with their exceptional performances. As the country fellows took a narrow 6-4 lead, Thatsarida accidentally fell down and suffered a shoulder injury. Her coach had to call for a medical time-out. The injury seemed to be serious and the game was likely to come to a conclusion. Nonetheless, Thatsarida refused to give up easily and instead she came back on the venue with greater determination. Her efforts bore fruits well as her team eventually won the third set 25-23 and gold medal. “We don’t really expect to come this far as there are many strong teams in this tournament,” said Thatsarida. The third place play-off earlier saw Sh. T. Cao/J.Dong easily beat Y.P. Wang/H. Xie 2-0 (21-14, 21-16) in an all-Chinese affair. 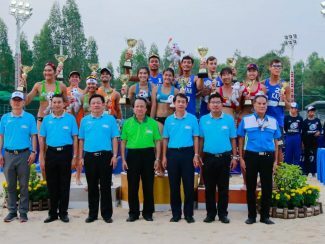 Thailand Volleyball Association President Mr Somporn Chaibangyang and Roi Et Governor Mr Wanchai Kongkasem jointly presided over the awards presentation and closing ceremony.